Tatura is a rural township in northern Victoria, 17 km south-east of Shepparton in the western Goulburn Valley. The name is thought to be derived from an Aboriginal word meaning a lagoon with rushes. Tatura township was surveyed in 1873 on the site of the principal watering place in the district, known as The Whim (a whim being a horse drawn device for raising water from a shaft in the ground). The survey coincided with the subdivision of pastoral runs for farm selections. A school was opened in 1873. The town grew fairly rapidly, particularly when the railway was extended to it in 1880 from Shepparton and on to Echuca seven years later. 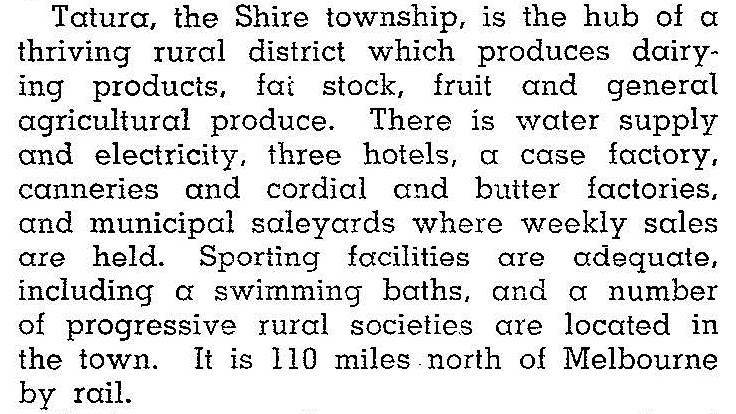 In 1886 the Tatura region was severed from the Waranga shire and named Rodney shire, and Tatura became the new shire’s administrative centre. 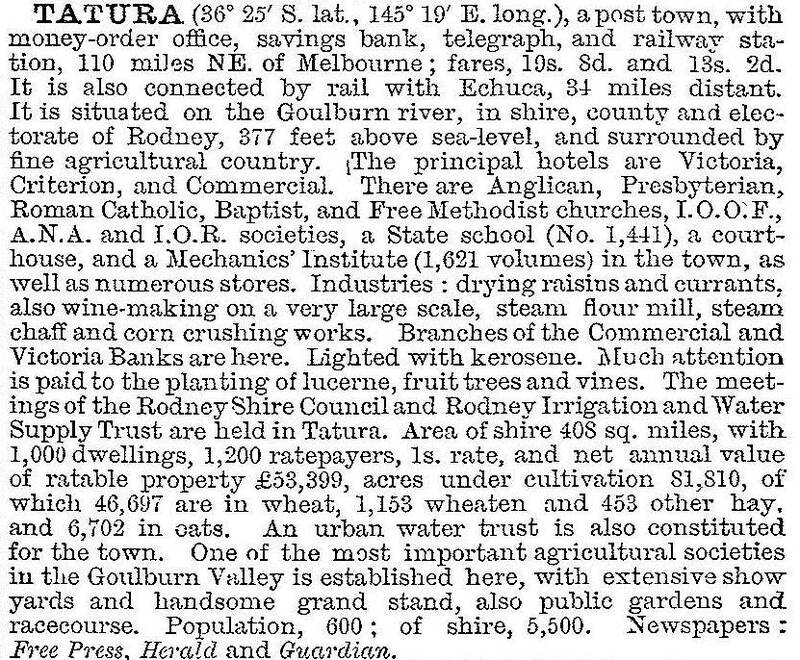 By then Tatura had six hotels, Catholic and Presbyterian churches, a mechanics’ institute and library, a flour mill, the school and an agricultural society (1880). Electricity was introduced by a plant which supplied power to a butter factory and reticulated for town use. The Victoria Hall (a memorial to World War I) was opened in 1926 and the Tatura Progress Association secured the opening of a fruit cannery which functioned for a few years until it closed because of persistent complaints about its smell. During World War II the Tatura internment camps were conducted near the Waranga basin for German internees and Australians with Axis Powers’ sympathies. The camps were garrisoned by 250 soldiers. One internee, of Nordic origin, operated a clandestine radio receiver. A German war cemetery for deceased internees of both wars was opened in 1958 as an adjunct to the Tatura general cemetery. Agricultural research (1937) produced tomato varieties suited to local conditions, and Tatura tomatoes were supplied to the Rosella sauce and tomato products factory (1949). The factory became part of Unifoods. Cleckheaton textiles opened a factory in Tatura in 1958. Tatura’s butter factory had its centenary in 2007, when it was merged with Bega cheese. Tatura has had a substantial Italian community since the 1930s. The community is strongly represented in tomato growing, and there is an Italian Social Club. The Tatura Male Choir has won several awards. Cleckheaton textiles closed down, as did Bartlett’s soft drinks factory (1985) after 105 years in Tatura. Goulburn Murray Water has its head office in Tatura. Tatura has a primary school (222 pupils, 2014), a prominent Catholic church and primary school buildings, Anglican, Uniting and Presbyterian churches, a swimming pool (1951), a recreation reserve and caravan park, a showground, a hospital annex, the Victory hall, several social and sports clubs, a golf course and a substantial shopping centre. The Tatura Irrigation and Wartime Camps Museum is open daily. It is in the original Rodney Irrigation Trust building (1888) in Hogan Street. The township is surrounded by farmland, with several main irrigation channels and subsidiary channels to properties. Tatura East is a separate orchard and dairying district with a primary school.